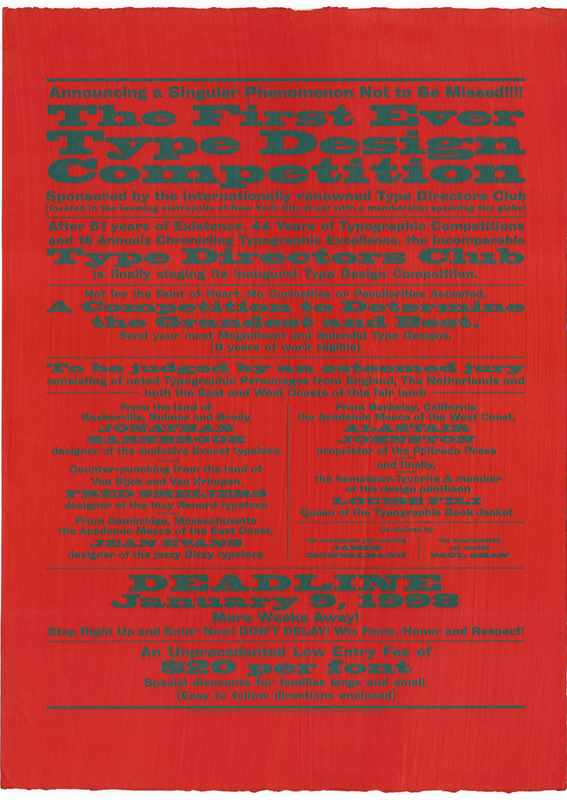 TDC2 Call for Entries (1997). This limited-edition broadside was designed to be sent to selected type designers and type foundries to encourage them to submit work to the inaugural type design competition organized by the Type Directors Club. James Montalbano and I were the co-chairs of the competition. I wrote the text—which is full of inside jokes—and art directed the broadside. James executed the ﬁnal design, choosing just the right typefaces (all digital) to perfectly achieve the P.T. Barnum effect I was after. It was printed letterpress by Peter Kruty Editions. The rough Arches paper was painted in fluorescent red and then the text was printed in silver ink. Some copies were printed in copper ink on paper painted purple.